Did you know that May is National Burger Month? May is the perfect time of year to celebrate this most iconic American summer-time food, isn’t it? 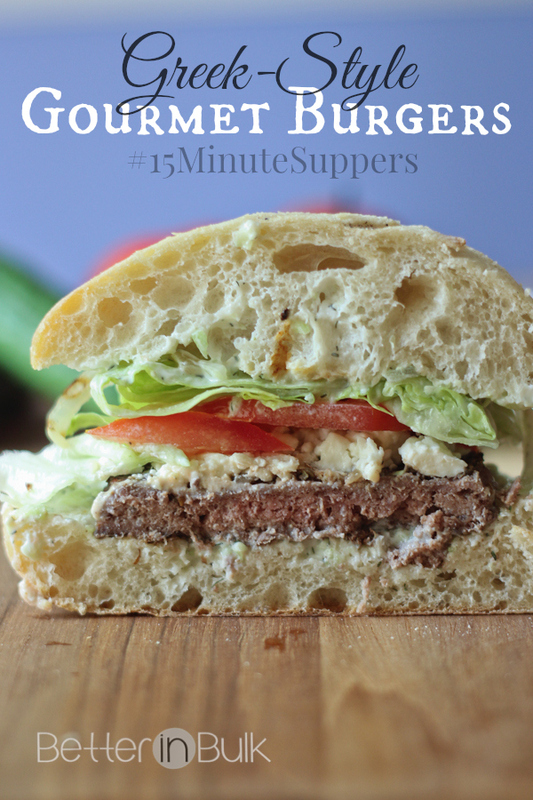 With Memorial Day just days away, and with it the unofficial beginning of summer, the rest of the 15 Minute Supper bloggers and I thought it would be perfect to commemorate National Burger Month with a collection of gourmet burgers that can be made in 15 minutes or less. When I was given the challenge of creating a gourmet burger, the first thing that came to my mind was a Greek burger with tzatziki sauce. I had never had one before, but I instinctually knew that it would be good. I LOVE Greek flavors (this isn’t the first time I’ve made a Greek-inspired 15 Minute Suppers – you should try my Gyro-style Greek Wraps). And, OH BOY, was it good! If I had a little extra time, I would mix the burger spices in to ground beef and form my own patties, but frozen patties are so quick and easy that this becomes a recipe for even the busiest of nights and not just special occasions. 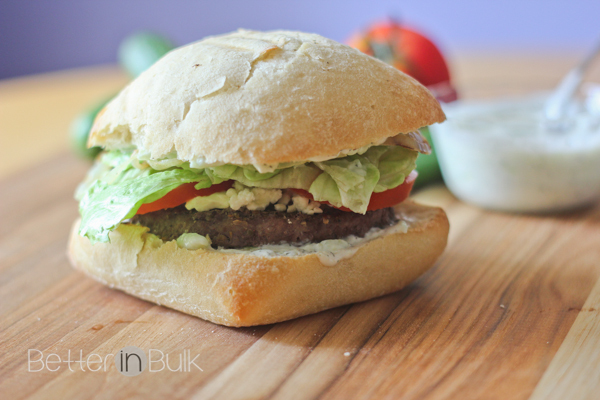 The ciabatta rolls were a lucky guess….and really made these burgers gourmet for me. I wanted something that was a little more fancy than a regular hamburger bun, and the ciabatta rolls did the trick. The only complaint was that my burgers were not quite big enough to fill the buns. Next time, I’ll go for larger patties! Ready for the recipe?? 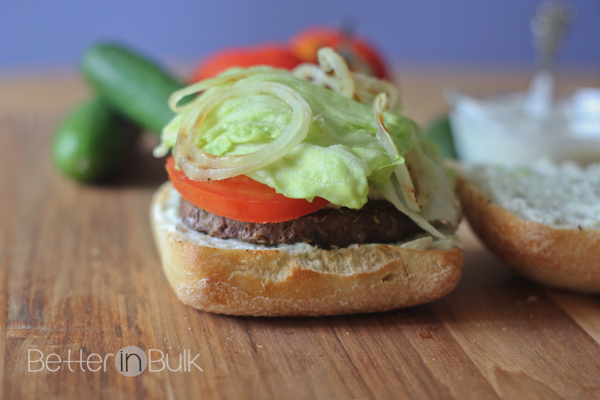 There are 3 parts to making this easy gourmet burger: Spicing and grilling the burgers, making the tzatziki sauce, and topping the hamburger. And, yes, as long as you stay on task and follow the instruction order, you really CAN make 4 gourmet Greek burgers in just 15 minutes! Mix the spices in a small bowl. Generously sprinkle and rub the spices on both sides of each burger patty. Grill each burger until cooked through (timing will depend on your grilling method and heat. I use an indoor electric grill that cook both sides at once, so it's super fast). 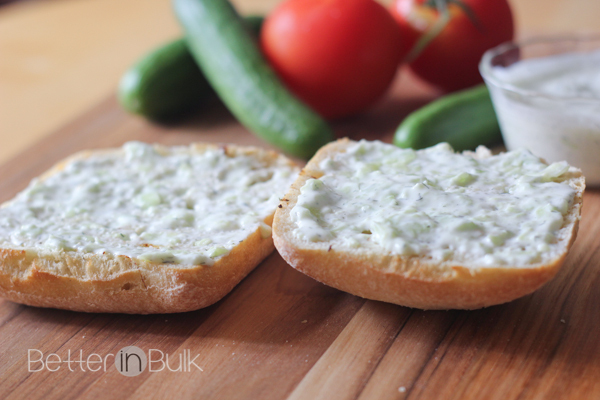 When burgers cooking, make the tzatziki sauce by placing all sauce ingredients in a food processor and blending gently (it only takes a few pulses - you don't want the sauce to be soupy). 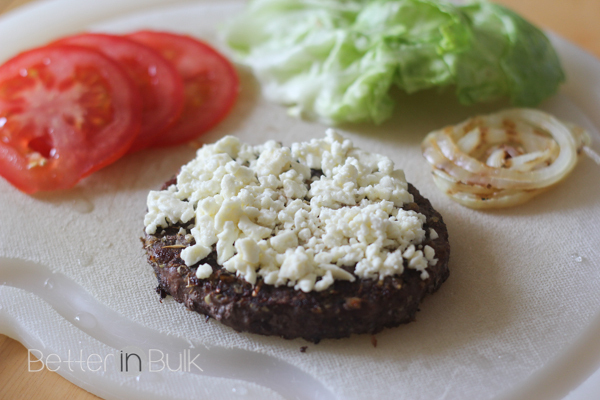 When burgers are cooked, sprinkle each patty with feta cheese and allow cheese to melt slightly. Toast ciabatta rolls (I placed the rolls, cut-side-down, on the grill after taking the burgers off). Generously spread each side of a sliced ciabatta roll with tzatziki sauce and then top with burger, tomatoes, lettuce, and anything else you might enjoy! 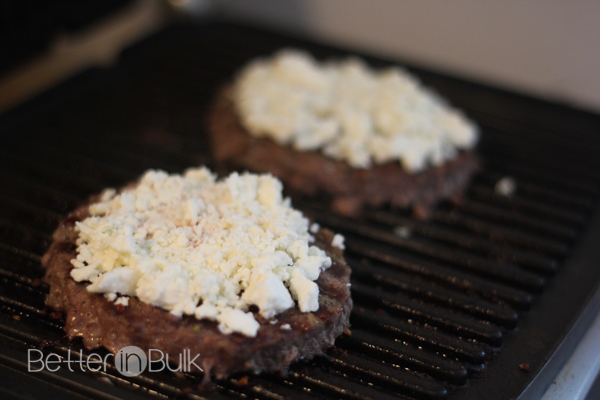 I grilled my burgers on an electric grill (like a panini press) and topped with feta cheese while still hot. 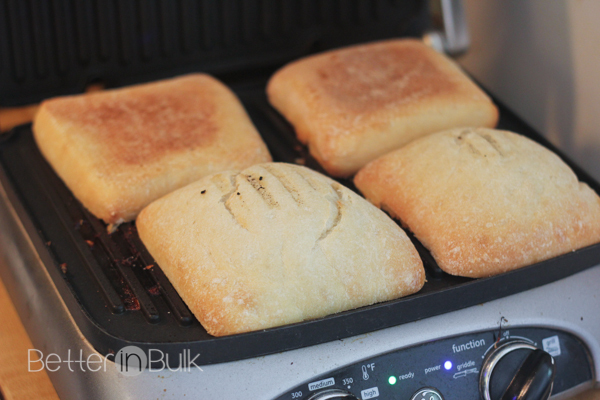 Toasting or grilling the ciabatta rolls pushed the buns to the next level. Yum! Add all the toppings and you’ve got yourself a gourmet burger, Greek-style! That sounds like a scrumptious combo! 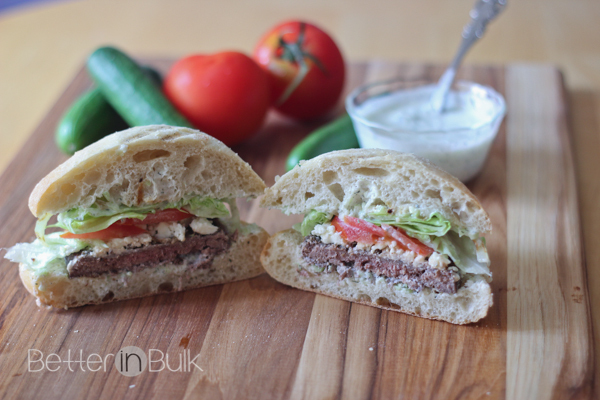 I love Tzatziki sauce and these burgers are so pretty too. Thank for sharing this with us at TOHOT! This looks so good! I love Greek food but I’ve never thought to create a burger with those flavors. Fantastic idea! Thanks so much for sharing the recipe! These sound WONDERFUL, I love Greek flavors! And I have to say the pics are wonderful! Did you mean GARLIC clove? I’ve never heard of clove spice for tzatziki sauce. Yes, I think you’re right. I will change that in the recipe. My husband is going to love this! He loves Gryos and is always trying to find good recipe for me to make them. So I know he will love this. Thanks! That sounds like a delicious combo! I love Tzatziki sauce. These look delicious, I love feta cheese on anything! I have not had any kind of Greek food before, but this burger looks pretty good. I’m not a fan of feta cheese so I would leave that off. MMM, Greek anything and you have my attention! Thanks for sharing! I bet the ciabatta buns are amazing grilled up like that! Looks great- I love Greek flavors! I love greek flavors. This sounds like a great summer burger.